Farmers around Lake Wairarapa are set to benefit from the introduction of dung beetles, which are the natural answer to rebalancing the environmental impact of livestock. Four species of non-native dung beetle are being offered to farmers throughout the region in subsidised packages designed to encourage on-farm trials that will lead to cleaner pasture, and environmental and economic benefits. The Greater Wellington Regional Council-led project will have properties bordering Lake Wairarapa offered around 1500 of the beetles at half price. The release of the packages will take place on November 11 during a sold-out function at Featherston’s Kaiwaiwai Dairies. Greater Wellington Environment Committee chairwoman Sue Kedgley said the dung beetles were part of a drive to improve freshwater quality in Wairarapa. 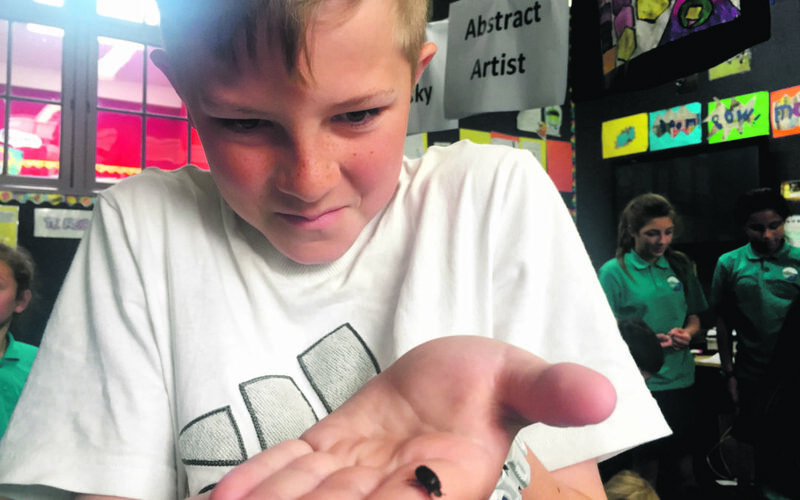 Students at nearby Pirinoa School were given a lesson on Wednesday on the benefits of dung beetles by land management adviser Kolja Schaller. Schaller hoped that one day the beetles would spread right across the country, but said it was still a long way off. “Once the beetles are fully established I’ve seen videos where after a dairy herd graze the paddock they’ll bury all the dung within 24 to 48 hours. While New Zealand has 15 species of native dung beetles, they had evolved for forest conditions, and species that could cope with grass needed to be introduced. The dung beetles being introduced to Wairarapa are known as tunnellers – the most effective at burying dung. A whole farm package of dung beetles would set farmers back $6000, however the council are offering a 20 per cent discount to other farmers in the Greater Wellington region. Under ideal conditions farmers can expect that within one to three years the species will become established, within four to six years there will be noticeable environmental and economic benefits, with established beetles beginning to freely breed, and between nine to 11 years the colony will be at full capacity and functioning optimally. Every year around 100 million tonnes of waste is produced by cattle, sheep and horses nationwide. Dung beetle use is approved by the Environmental Protection Agency.